Dogwood trees are flowering trees used in gardens and landscapes throughout the country. These trees grow to differing heights, depending on the variety. 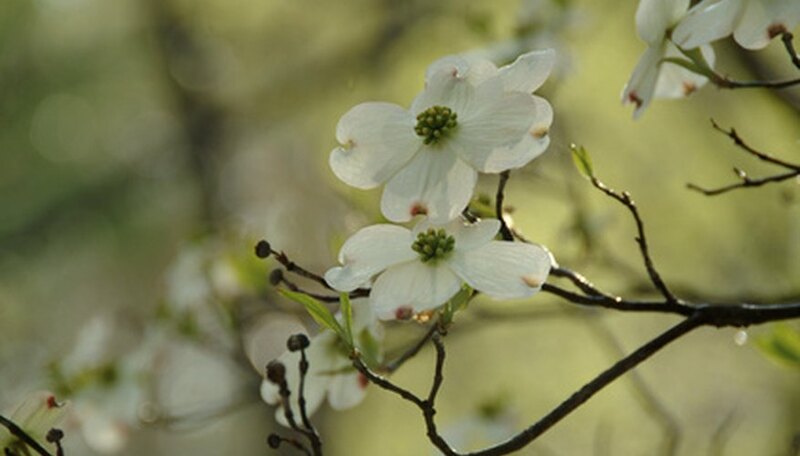 Flowering dogwood trees come in species native to North America and can be grown in USDA growing zones 2 through 9. The various species of dogwoods produce breathtaking blooms of white, red, red-pink, pink and yellow. Growing dogwood tree seeds will provide you with seedlings that you can grow into new dogwood trees. Gather seeds from your dogwood tree in the fall. Look for red berries (seeds) to form from the blossoms. Pull the seeds carefully from the tree. Use more seeds than you need to ensure enough will grow into dogwood trees. Place the seeds in a small bowl filled with water. Soak for two days to soften pulp on the seeds. Rub the seeds until you get rid of the outer pulp. Fill the seed trays (pots or containers) with a mixture of half peat moss and half sand. Make a hole ½ inch deep. Place a seed in the hole. Space the next seed 1 inch apart and make any rows 6 inches apart. Water the seeds thoroughly. Add a thin layer of mulch or compost to cover all the newly planted dogwood seeds. Place a protective screen over the tray to keep animals away. Keep the tray outside until spring and only water again if soil completely dries. Supply a small amount of water (1/4 cup) two times weekly, once the dogwood tree seedlings appear in the spring. Apply the water carefully because the seedlings are fragile when they first emerge. This amount may vary, depending on the size of the container you are using. Give enough water to each plant to keep the soil moist. Continue to water the seedlings through fall, when it fails to rain. Apply a standard fertilizer, such as 10-10-10 every six weeks until the beginning of September. Spread 1 tsp. per square foot of growing space over the soil around each seedling. Water the growing dogwood seedlings after fertilizing. Dig a hole that is the same depth of the container (tray or pot) the seedling is growing in, but twice as wide to transplant the dogwood in the first or second winter season. Carefully remove the seedling from the container and place it in the hole. Backfill dirt into the hole and water the dogwood tree thoroughly.